Serge Lutens’ La Myrrhe was one of the handful of fragrances given five stars in the book Perfumes: The Guide (Turin/Sanchez), so I decided to wangle a sample of it from The Perfumed Court and at least give it a sniff. Frequently I am perplexed by the scents that Turin and Sanchez rate as outstanding. There are several Estee Lauder fragrances that received five stars, and I don’t like any of them. I don’t like them, as in, “If you’re TRYING to kill me, go ahead and put Beyond Paradise on my skin!” There seems to be a common base to the Lauder scents – Lauderade? – as there is to many of the classic Guerlains and Carons, and to Ormonde Jayne and Tauer perfumes, and the Lauder base absolutely nauseates me. More on P:TG and the Lauder scents in another post, but I will point out that often Turin and Sanchez are absolutely on the money with their ratings. This is such a case, in my opinion. La Myrrhe is, to put it plainly, beautiful. It seems rather simple to me in terms of structure: aldehydes, mandarin, anise, and myrrh. That’s all, although the list of notes is considerably longer. But simplicity and quality materials can add up to pure gorgeousness, when all the pieces dovetail. 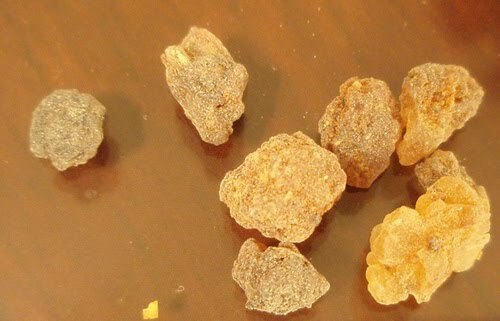 And they do dovetail here, at the crossroads where the clean klieg lights of aldehydes, the angularity of anise, and the medicinal spiciness of myrrh overlap, a Venn diagram of weird loveliness. The fragrance seems all of a piece, cool and smooth as a worry stone, and I found myself at peace when wearing it. I agree with much of her analysis, including her observation that La Myrrhe may be difficult to wear. I certainly would not reach for it often. 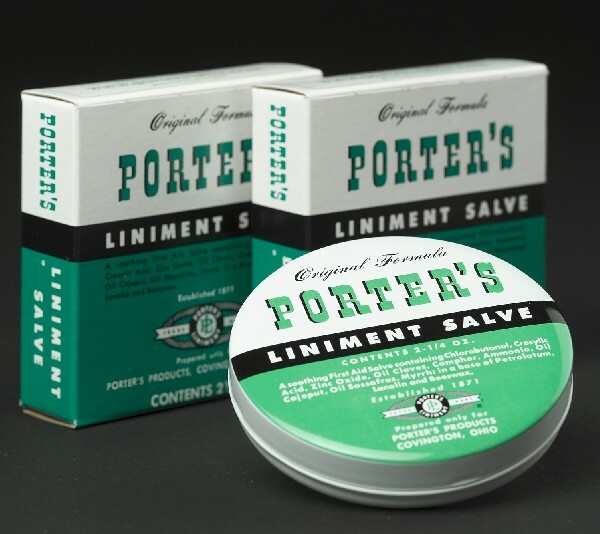 However, there is a very specific, very personal reason for me to love it, and that’s why the subtitle of this post is “Healing in a Bottle.” What La Myrrhe reminds me most of is that homely, sticky yellow stuff that came in the green-and white tin: Porter’s Liniment Salve. I have a mostly-full 2-ounce tin in my bathroom cabinet – it’s twelve years old, minimum, and seems not to lose any efficacy with age, at least going by results. This magic stuff predates antibiotic ointment (the formula was patented in 1912), and, in my experience as an active child and as the mother of active children, actually works better. Listen to what’s in this stuff: “Chlorobutanol, cresylic acid, zinc oxide, camphor, ammonia and oils of cajeput, clove, sassafras and myrrh in a base of petrolatum, beeswax and lanolin.” Cajeput is tea tree, or melaleuca, oil, which is antiseptic and analgesic; cresylic acid is synthesized from coal tar, chemically related to creosote, with antifungal action; chlorobutanol sounds nasty but is a mild anesthetic with antifungal and antibacterial properties. Caution: the salve is rather greasy – it sticks to skin well, without stinging – and can stain clothing yellow. I repeat the list of odorous ingredients: camphor, creosote, ammonia, cajeput, clove, sassafras, myrrh, beeswax and lanolin. These are not exactly quiet smells. They proclaim loudly that they are about their medicinal business, fighting the good fight against bacteria and disease. The combination was one of the most distinctive smells of my childhood – and one frequently smelled, too. (I fell down a lot.) Mom often anointed me with Porter’s, topping it with a Band-Aid and a kiss before proclaiming me Good As New. Smelling Porter’s makes me feel loved, tended, and healed, a deeply emotional experience. I may therefore be one of the few people in the world who can actually enjoy wearing La Myrrhe. Commenters at other perfume blogs and forums often point out that it is a cold fragrance, with no warm amber or fuzzy fruit to set off its marbled perfection, that to many of them it smells painfully medicinal, and also that it seems more an artistic exercise than a full, rounded perfume with its own story. They may be right. But to me, La Myrrhe has such a striking resemblance to the “good parts” of Porter’s Liniment Salve that I begin to think I need a decant, for days when I feel bruised and scraped by the world, and in need of a mother’s kiss. Photo of myrrh from flickr, some rights reserved; photo of Porter’s Liniment Salve from lehmans.com. Holy beejeebers! That list of ingredients for the Porter's is setting up quite a racket in my head, just thinking about it! :)What a wonderful (and wonderfully written) introduction to La Myrrhe. I totally get what you get about it. You make me think about how sometimes I think I could learn a lot about people if I could get a good picture of just what they see/hear/think/remember when they experience a perfume. Or any scent, for that matter…but particularly some sort of scent composition. Part of the trick, though, is that I would also have to understand the mechanics of how it comes to them, which as we know is a Your Mileage May Vary kind of thing.Then comes context, history, emotion, personal taste…a really cool stew, actually. :)You have inspired me to try out La Myrrhe next time I'm on an expedition. I'm curious to see where it will take me. Hi! Thanks so much for dropping by and commenting – I appreciate it very much.And thank you for the observation that yes, YMMV – for everyone, since we all have backgrounds and emotional reactions unique to ourselves. And since we can't turn our heads inside out… and probably wouldn't want to… we all walk around not understanding each other. I'll pop by your blog sometime soon – are you interested in a sample of that Balenciaga Michelle? If so, please email me at the address listed on my profile. Thanks! Hiya…Yes, I am interested in Michelle…and I see on NST you are interested in Tabac Aurea…we can send happy little packages in two directions…but I don't see your e-mail in your profile! Zoiks…am going to try to enable e-mail connect in my blog. Okay, I THINK I've fixed it so that an option for emailing me will now pop up when you click "View my complete profile."